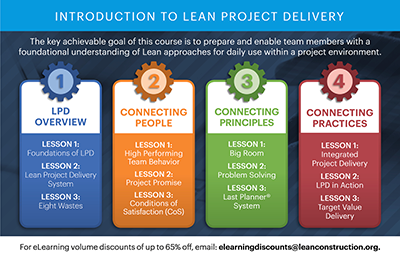 Deepen your Lean knowledge without taking valuable time away from project work, with LCI eLearning courses. 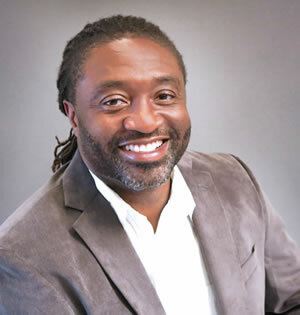 With the recent addition of eLearning courses to the LCI Immersive Education Program, busy design and construction practitioners can advance their Lean journey on their own time, from any smart device. Each eLearning course includes downloadable resources, knowledge checks, multimedia, and hands-on interaction to increase knowledge retention and accommodate personalized learning styles and schedules. New eLearning courses are released periodically. 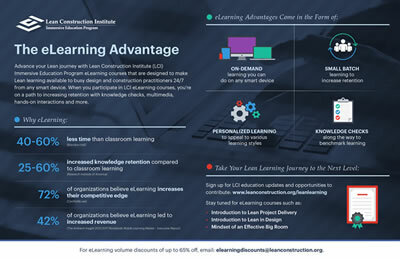 Exclusive eLearning volume discounts for LCI corporate members! Volume discounts of up to 75% off are available for LCI corporate members! Effectively train more people in less time with personalized eLearning courses. 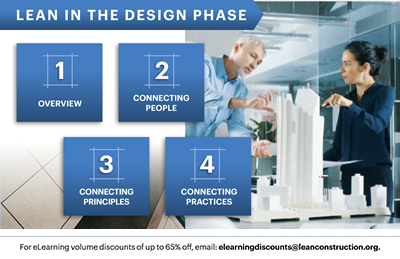 Email elearningdiscounts@leanconstruction.org for more information on volume discounts and other eLearning pricing. Click to open a pdf version of this image. RECOMMENDED BROWSERS: Lastest Internet Explorer or Mozilla Firefox. Sign up to receive more information on eLearning. Note: you must have a MyLCI profile to access. If you do not already have a MyLCI profile, please create one here. For step-by-step instructions for accessing eLearning, use this Quick Reference Guide (update coming soon; contact eLearning@leanconstruction.org for direct access instructions). Looking to earn continuous education credits? If eLearners are seeking continuous education units (CEUs) for LCI partner organizations, they can self-report 1.5 AGC CM-Lean CEUs and/or 1.5 AIA CEUs. E-Learners can only self-report for credits when they complete each knowledge check and final assessment with a score of 80% or higher. Get the information and resources you need to transform the Design and Construction industries.